Chalkboards, Table Talkers, and Easels are some of the key lines in our chalk board section. We produce a wide variety of chalk products, ideal for the pub, bar, hotel, and restaurant environment. We have a lot of innovative new wooden products, such as wine holders, newspaper racks, and wooden display frames. We also have ornate poster display cases, which have a blackboard back ideal for permanent branding. 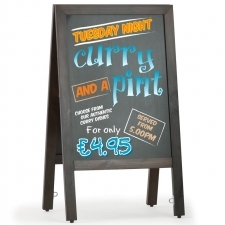 We also offer a full bespoke service on chalkboards, and chalk a-boards. Please call us for further details.